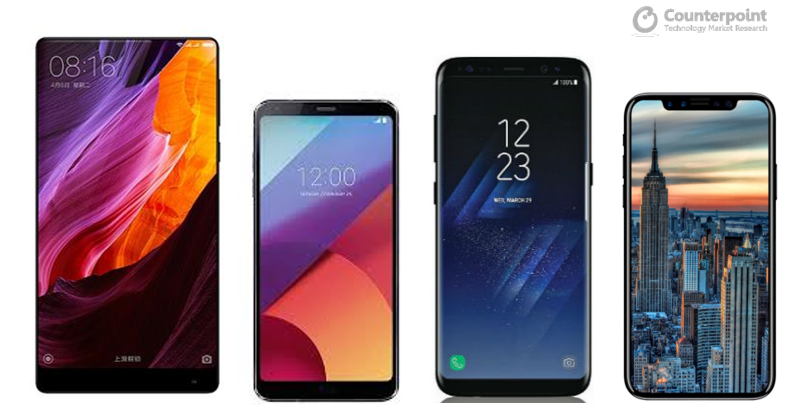 In a quest for increased display sizes and new forms of hardware differentiation, leading smartphone OEMs are turning to new solutions to increase the effective display viewing area without increasing the overall physical size of the devices. With Sharp’s Aquos, we have already seen one of the first phones trying to break shackles on bezels in 2014. However, it was not successful due to limited roll-out, poor battery life and a bulky design. So was Xiaomi’s Mi Mix, launched in 2016 with much fan-fare but bench marked heavily on Sharp’s initial design. While more of a proof of concept and only available in limited quantities, it also suffered from a bulkiness that deterred many. Fast forward to 2017, the vertically integrated Korean smartphone brands LG and Samsung, leveraging their display business and technologies, are getting it right. The LG G6 sports a beautiful LCD-based 18:9 display and Samsung’s Galaxy S8 series shows-off a much brighter, color-rich, curved OLED display. Apple is rumored to also launch an OLED version bezel-less display in its “special edition” smartphone later this Fall, marking its tenth anniversary for the iPhone. This should drive the bezel-free or alternative aspect ratio trend into a high scale and high demand feature. Next year’s flagships from competing brands will have to toe the line or risk being marginalized. As with most areas of hardware differentiation, with few suppliers controlling OEMs’ access to this technology, the sustainability of the differentiation is levered to availability and supply. For 2017 both are likely to be limited, meaning that only those that gain access to the technology will be able to eke out some level of differentiation. 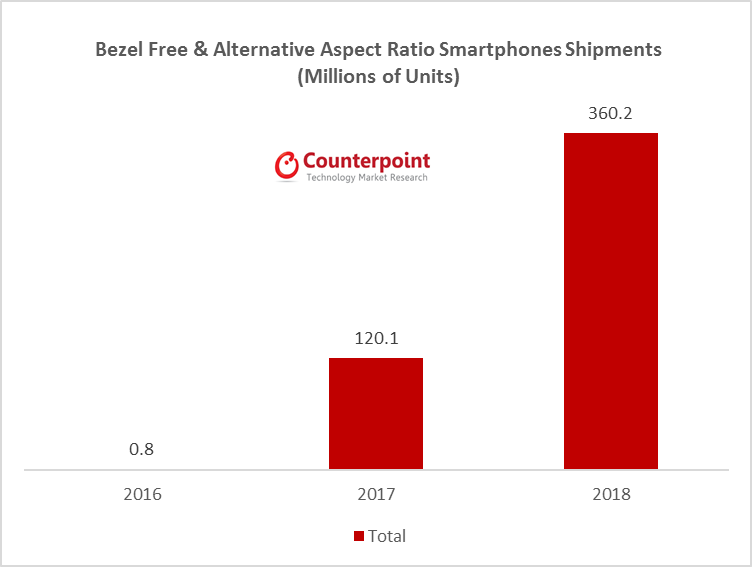 Counterpoint forecasts more than 120 million smartphones including these differentiated alternative aspect ratio and near bezel-free displays will ship in 2017, accounting for almost 7% of the total smartphone shipments this year. 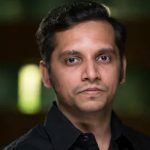 This demand will more than triple next year as we see supply issues ease and more OEMs will be able to offer bezel-free flagship models in their portfolio in the second half of 2018. The trend towards bezel-less designs and 18:9 aspect ratio displays and the benefits and downside of both solutions, is captured in our in-depth report (here) which further evaluates whether these trends are likely to be adopted by all OEMs. The comprehensive and in-depth report on component research is available for subscribing clients. Please feel free to contact us at [email protected] for further questions regarding our research, insights or contact at [email protected] for any press enquiries.